When snow and ice hits, disruption is very quickly caused and hazards quickly form. If you're a business owner or if you work with the public, you'll understand how dangerous cold weather can be and what problems it can cause. If access to buildings and footpaths becomes unsafe, businesses may have to close - as might schools, medical facilities and other services. That's why Ricky Tyler Landscapes now offers snow ploughing and gritting services throughout wintry weather. 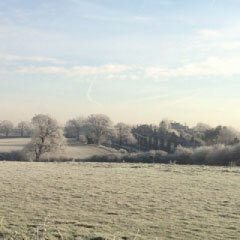 When snow and ice hit, or when temperature forecasts drop, call in our specialist team. Using state of the art machinery and high quality rocksalt, we can quickly cover large areas with professional grade grit. This grit reacts with snow and ice and causes it to thaw, and is a big help in preventing ice from forming in the first place. The grit also makes slippery ground much easier and safer to walk or drive on, creating traction and ensuring that falls or collisions are less likely. With fast action, problems caused by the cold weather can be prevented. That's why our winter services are available 24 hours a day, 7 days a week. We can get to you quickly and clear your premises, allowing your staff, students or patients easy access to the building. We also work with local authorities to clear roads and pavements on a contract basis; if you'd like to know more, please call Ricky Tyler Landscapes today. From schools and hospitals to factories and retail premises, we're here to make sure that you can stay open and that the risk of an accident is lessened. Outside of the winter season, we're your local landscaping and garden care specialists, keeping your grounds looking sensational, season after season. 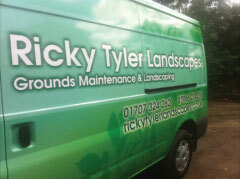 Ricky Tyler Landscapes can provide gardening and grounds maintenance services including Gritting covering London, Essex, Hertfordshire, Northampton, Buckinginghamshire & Bedfordshire .